Here are a couple of cute free downloads for you to enjoy. 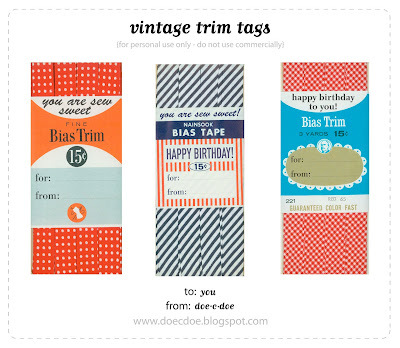 Click here to get these wickedly creative gift tags from Gina at Doe-C-Doe (discovered via How About Orange). Great for the sewer in your life. And the ever creative Miss B over at Bla Bla Blag is offering this fun mini notebook download. I want to make my with grid paper inside. You can get the notebook covers and directions here.